Sleeping under the stars used to be the one of the coolest ways to relax. That was until a Finnish resort came up with a concept that takes sleeping to the next level. 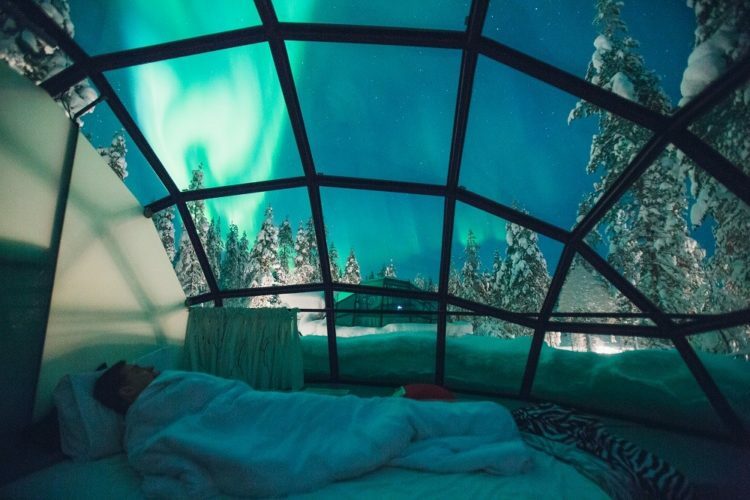 Located in a peaceful and secluded area in northern Finland, Kakslauttanen Arctic Resort created glass and steel domes to let you watch the Northern Lights from a warm and comfy bed. The resort is located in northern Finland. The closest airport is in Ivalo, which is about a 30-minute drive away (depending on the amount of snowfall, of course!). For most travelers from the U.S., flying to Ivalo will require two stops, and prices seem to start around $1,000 per person depending on where you’re flying from and how far in advance you book. 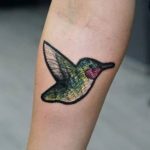 Many of the routes will fly you through Helsinki, the capital of Finland, which sits on the Gulf of Finland at the southern tip of the country. This could be a good city to spend a couple days on either end of your trip, particularly if you’re not keen to spend too much time in almost total darkness. 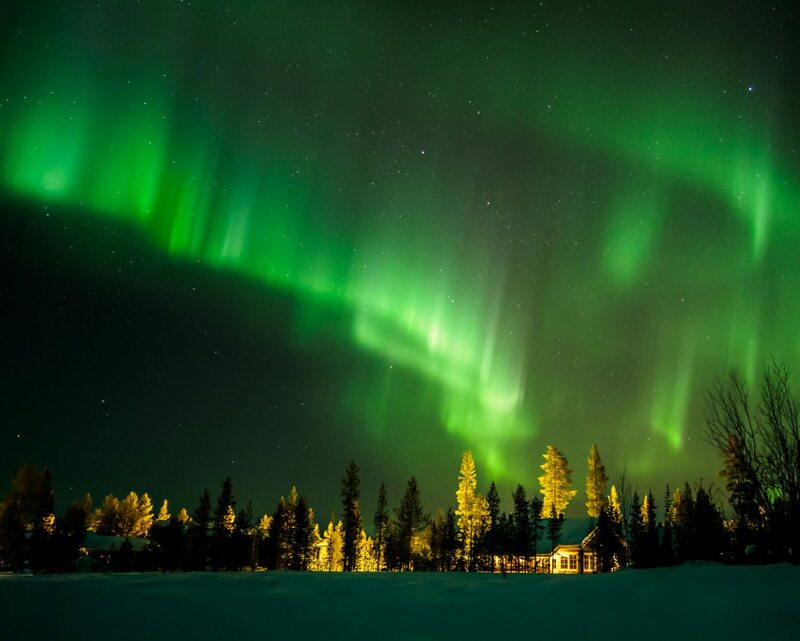 Lapland, which comprises the northern section of the country, can have just an hour or two of sunlight in the deepest winter months (of course the bonus here is those amazing Northern Lights!). While southern Finland does see reduced sunlight in winter, the shortest day of the year still provides about six hours of sunlight. According to the company website, this amazing travel destination was created in 1973 when its founder was traveling through an isolated part of northern Finland. His car broke down and he was forced to make a camp in the woods. As he was laying in his camp, he was struck by the beauty of the area and with that inspiration created the Kakslauttanen Arctic Resort. 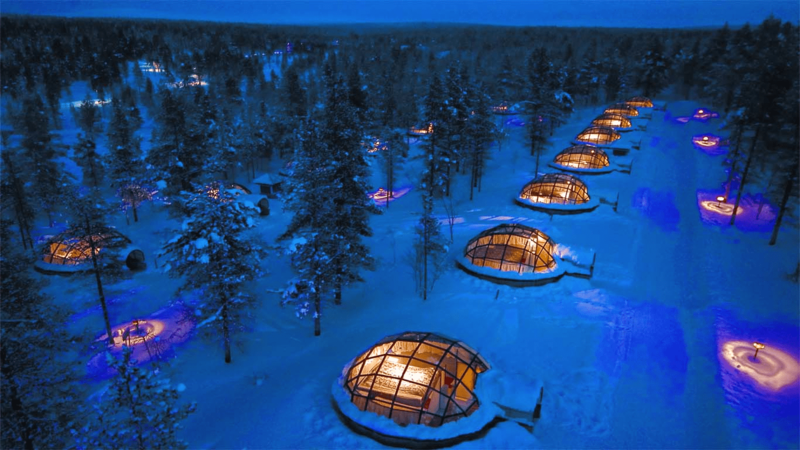 There are a variety of different lodging options including glass igloos, snow igloos and log cabins. You can even visit the resort’s event space decked out as Santa’s home during the holidays. How magical would it be to spend Christmas in this part of the world? 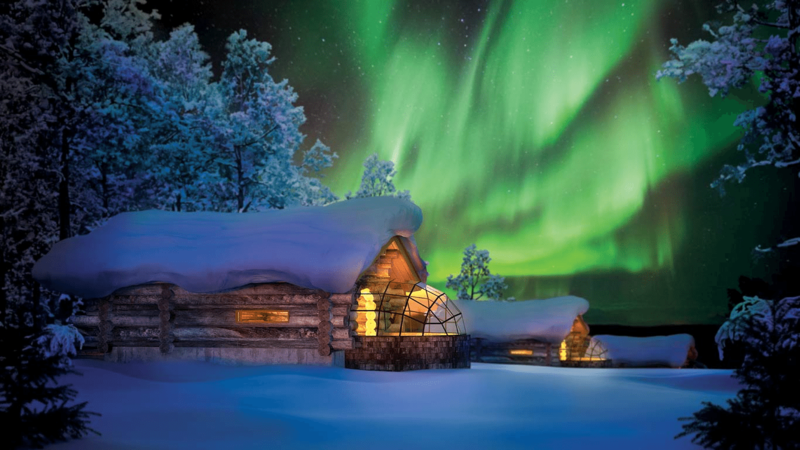 The glass-covered igloos give you an unobstructed view of the Northern Lights above. You can stay with up to four people, depending on the size of the igloo you reserve. The igloos are available throughout the Northern Lights season, from the end of August through the end of April. If you’re looking for a little more space and comfort, the resorts newer Keto-Glass Igloos sleep six and feature the amenities of the resorts Log Chalets—including a kitchenette, fireplace and private sauna. The bonus is the glass-topped bedroom that gives you a view of the sky above from the comfort of your bed. 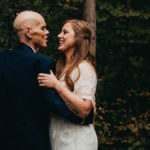 While you probably wouldn’t book an extended stay in one of the resort’s snow igloos, it could certainly be a fun experience to try for one night. 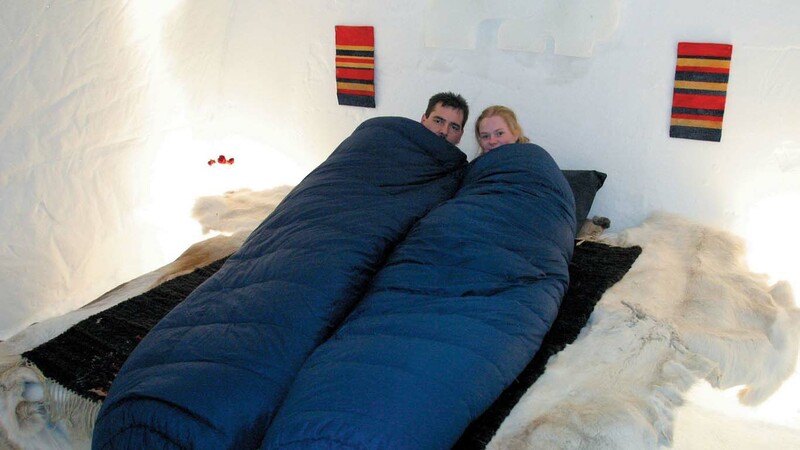 The resort provides down sleeping bags and all other comforts required to stay cozy inside your room made of snow. According to their website, the temps inside are between 21 to 26 degrees Fahrenheit, so you’ll definitely want to stay bundled. The Northern Lights (aka aurora borealis), are visible in Lapland approximately 200 nights a year from the end of August through the end of April. 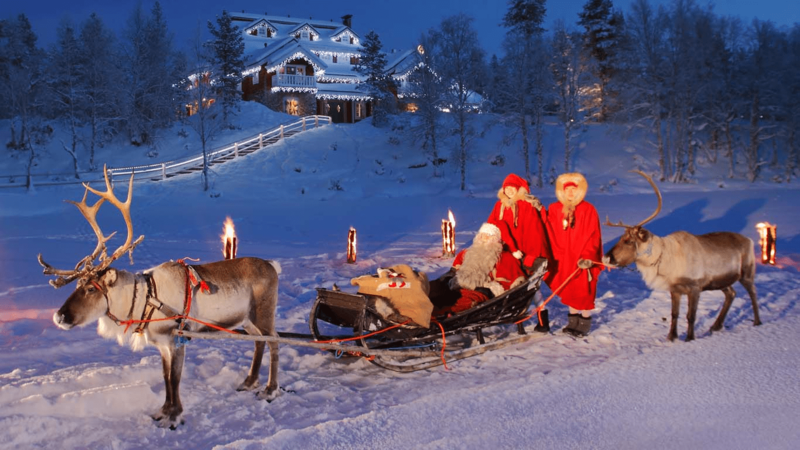 According to one math-savvy TripAdvisor user, the likelihood of catching sight of them on any given night in Lapland is 10-20 percent, so you may want to book your trip accordingly. RELATED: Snow and ice not your thing? Check out this hotel that floats in the middle of the ocean!